A month or so ago I visited the Orthodox Church of the Virgin Mary in Beit Jala, Palestine. I captured a picture of this stone (see image below and the original post here) but struggled to capture the story. The oddly cut stone sits at the front of the nave. When Joseph, Mary, and Jesus fled the wrath of Herod, they stopped to rest by this stone. Thieves attacked them but found that the Holy Family had no possessions but the donkey. So they took it. 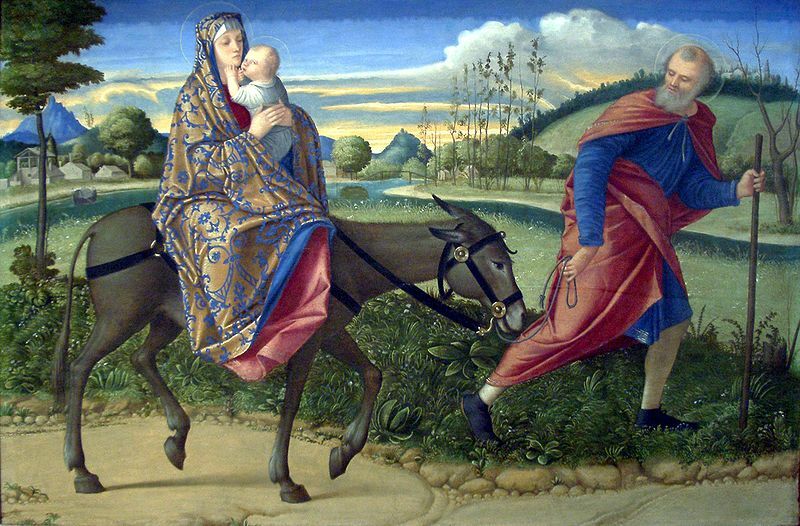 Carpaccio's "Flight into Egypt" about 1515. Image from here. Later, one of the thieves, named Thismas (or Dismas, according to the apocryphal Gospel of Nicodemus), was confronted by an angel. He was told that if he returned the stolen donkey, something good would happen to him. So he did. It was this thief, my new friend told me, who was crucified next to Jesus. Now that hardly sounds like a good thing, save for the fact that this man turned out to be "the penitent thief" who asked to be remembered by Jesus and was promised paradise (See here for Luke's account of that moment). If I had been thinking more quickly I would have asked Father Yusef what offense earned him a death penalty at the hands of the Romans some 30 years later. A page from the Gospel of Nicodemus. This apocryphal book names the "good thief." The original manuscript may be as early as the 4th century. Image from here. The stone was originally in the Church of Elias in Jerusalem, but after that structure was damaged by the Turks it was brought it to Beit Jala. You can find it there to this day. Yours truly inside the Church of the Virgin. Note the presentation of the stone on the far left (just beyond the last bench). The photographer who had come with Father Yusef for the baptism offered to take my picture.